Safely, effectively and painlessly reverses early stage cataracts without surgery. Easy to use - two drops applied twice per day. No side effects - the Nu-Eyes™ formula is based on a natural molecule found in the human body. Eliminates the possibility of complications commonly experienced after eye surgery. 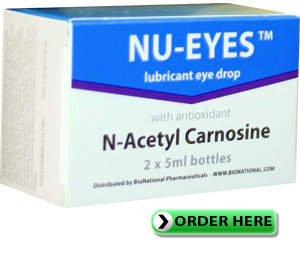 Effectiveness of Nu-Eyes™ has been validated by numerous clinical studies. independent lifestyle, such as preserving your driving privileges. Will NU-EYES™ drops work for me? Nu-Eyes™ has been proven to produce great results for most people. The duration of treatment depends on the cataract stage and your overall physical condition. and watch videos. You will learn a great deal on the subject matter. and your future independent lifestyle. This is why we recommend you proceed to the next step. 2. Call (800) 378-8428 and speak with one of our customer support representatives. All of your questions are important. We are here to help. our products securely online or over the phone once you feel confident in your choice. This short video compares cataract surgery with non-surgical cataract treatment. Warning! This video contains graphic content. This short video discusses some of the causes of cataract. Thousands of people have reclaimed their vision by simply applying Nu-Eyes™ eye-drops twice per day.